From Gamerizon Studios, Chop Chop Kicker is a fast, simple, and compelling game for the iPad, iPhone, and iPod touch. The concept is simple, but it will keep you entertained for as long as your iPhone’s battery holds out. The game begins when a caveman runs up and kicks a small dinosaur for as far as he can. Your job is to use your finger on the touch pad to draw lines under the dinosaur’s trajectory, to act as ramps for the dinosaur and keep it in the air for as long and as far as possible. Your lines are produced by a marker whose ink is replenished by guiding the dinosaur into jelly beans scattered throughout the level. When your marker runs dry, you’re at the whim of gravity– and the various obstacles that fill the sky. Besides jelly beans, the sky is full of pillowy clouds that will deaden your momentum and chickens that will drop kick you if you collide with them. The ground is also littered with drop-kicking dinosaurs, hungry Venus flytraps, and stone blocks to obstruct your path. Fortunately, there are plenty of power-ups to help propel you through as well, like the magnet to help you draw in jelly beans, or the gum ball to let you float by in a bubble. 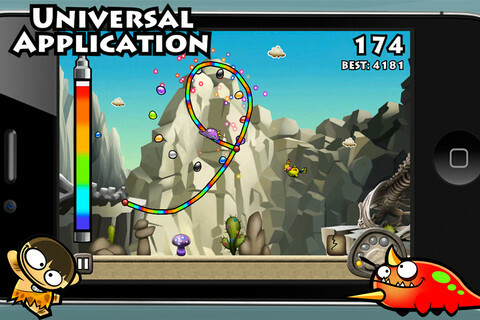 With a little practice, you can guide the dinosaur into the power-ups and avoid the obstructions, and keep the little guy in the sky for incredible distances. Even once you’ve hit the ground, if you’ve got a little marker ink left, you’ll be surprised at the recoveries you can pull off. Chop Chop Kicker is a free application for anything running the iOS software, so anyone with an iTunes account can pick it up and start playing immediately. There’s no worrying about getting your money’s worth, because it’s a free app — even if you don’t like it, you’ve lost nothing. 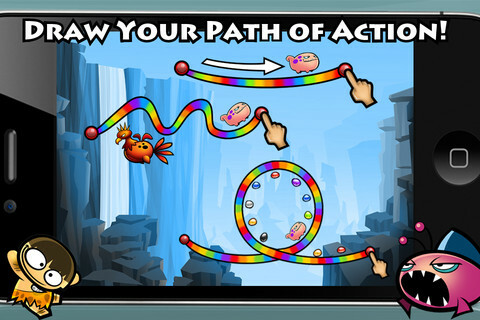 The graphics are done in a cute, cartoonish style that makes it easy to recognize objects on screen even at the swift pace you’ll be moving. The control system is easy to get the hang of– you simply trace lines on the screen with your finger. There’s lots of unlockables to discover, and there’s optional Facebook compatibility for those that want it. As a casual, “pick-up-and-play” app, you can play a few rounds here and there throughout your day wherever there’s a free minute to open an iPhone app. But playing Chop Chop Kicker is fun and addictive enough that you may want to just sit down at the end of the day and play it for an hour or so — at least, it may not feel like an hour to you. AppSafari review of Chop Chop Kicker was written by Darius Reimm on September 30th, 2011 and categorized under Action, App Store, Arcade, Free, Fun, Games. Page viewed 3824 times, 2 so far today. Need help on using these apps? Please read the Help Page.